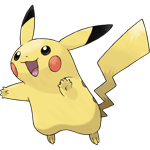 Pikachu is the twenty-fifth Pokemon on the National Pokedex and was introduced in Generation I (Red, Blue, Yellow). Pikachu serves as the sole Starter Pokemon in Yellow Version (Special Pikachu Edition) and is iconic as Ash's Pokemon in the Anime. Because of this, it serves as a symbol of the Pokemon franchise. 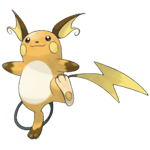 Pikachu is an Electric type Pokemon. 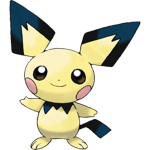 It is a Stage 1 Pokemon (Basic in Generation 1) that evolves from Pichu based on Happiness and evolves into Raichu by using a Thunderstone.